The fourth and most kitchen design related Astoria Granite Countertop comes from India. Since she has some silky, smooth and fluent feeling, she may use the historic Silk Road too, who knows. The colors of Astoria are usually tone of all creams and she has brown golden sparkles. Her infinity look pushes me always to cook and prepare some food. Sometimes granite names are being very confusing, so Astoria can be named as Ivory Chiffon, Ivory Crème, Kashmir Crème, and Millennium Cream. She is such a gorgeous bracelet on any color of cabinets. White, cream, natural oak, cherry, walnut and cappuccino is my favorites. The best part of picking Astoria countertop I think, is used at many different design styles from traditional to contemporary. 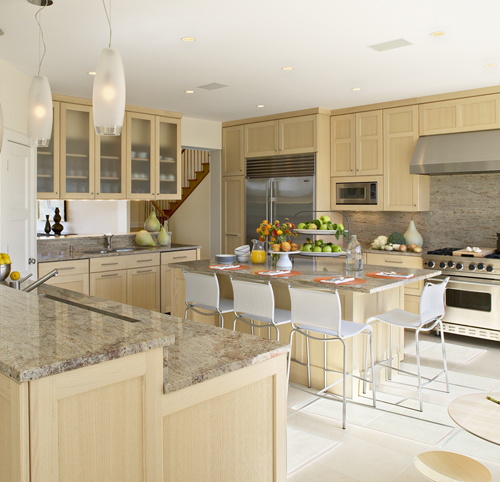 In white color cabinets usually darker color of Astoria Countertops can be picked. Darker colors are very rare and little over budget of this fairytale countertop. Off white kitchen cabinets, can hug the lighter color of Astoria . Instead of pure white, in these days, off white, aging white and cream colors are more fashionable in these days. If you go for the natural oak, she shows better when you pick the backsplash as Astoria Granite too. By this way, fusion of the color is more visible and you do not need to pick the right backsplash. By the way natural oak is being trendy in kitchen remodeling. Cherry cabinets with fairy countertop. Picture credit Amber Ranzau- hat haus ,inc.
Cherry color cabinet is one of my best by matching Astoria and if you are lucky enough to find some pink specs in the stone, your kitchen can be refaced like a very upper class kitchen by having cherry kitchen cabinets and Astoria Granite countertop. Walnut cabinets are such a good pair for Astoria Countertops. With the well lighting big kitchens this could be such a good option. I am hoping that my information finds you well and please add your comment with your experiences or for your future kitchen.If you are still curious about granite material, I may suggest you to check the Granite Countertop : Kitchen Countertop Materials article of mine.